The difficult bit of taking part in the bundle marathon is the very ambiguous topics. Sometimes I really struggle to put together a post relating to the title, but I guess that's part of the challenge right? 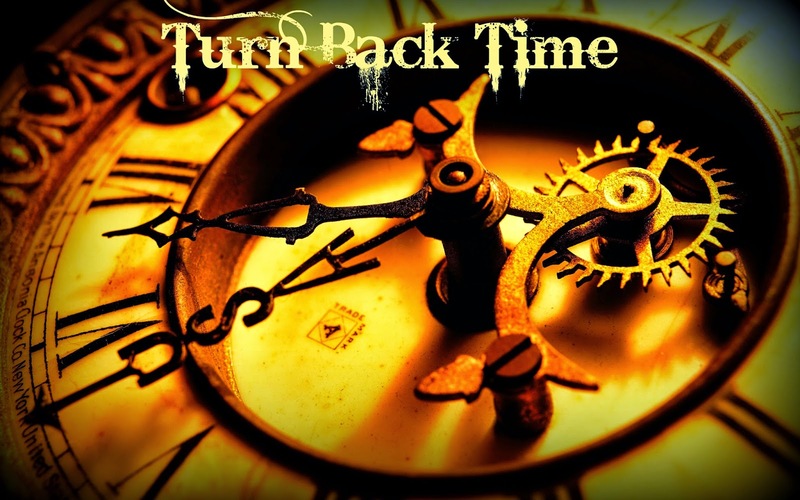 So this week the topic is turn back time, this could be open to interpret in so many different ways and I wasn't sure which way I should take this. I guess I could have touched on fashion of the past, or old beauty trends or something, but recently I have been enjoying writing about a wider range of topics and I find it helps me express myself and work through issues in my life. I started blogging a long time ago because I was inspired by others but I struggled to find my niche, so I rebranded and started a fresh nearly a year ago now and my main aim was to write for me. I wanted blogging to help me free my thoughts and creativity and hopefully some day create a career out of it. Now I'm not sure if that will ever happen but it certainly helps me, because it gives me a place to write about whatever I want, because it's my space on the internet and no one can tell me I can't. I haven't had the easiest life, I seem to attract bad luck and I have faced so many struggles in my time and sometimes find myself asking in amidst a flurry of tears "why me?" Why can't I just catch a break, it seems whenever I get myself back on my feet something else will come along to pull the rug out from beneath me and I tumble in slow motion to the floor once again. So I ask myself, if I could turn back time what would I do? If I had the gift to be able to turn the clock back I'm not sure at what point in time I would go back to. My first thought would be to turn back to being 16 years old, when I met my first proper boyfriend. If I could go back to that point and have not talked to him and let myself get sucked into such a destructive and soul shattering relationship where would I be now? But on the other hand I think to myself, everything I went through with him has made me who I am today, for better or worse. What would I have been like if I had taken a different path? Because of him I have a story to tell, not a good story at all but a story all the same. So maybe I would still let myself meet him and experience some of the bad, so I would be able to appreciate the good. I just wouldn't have stayed so long and wasted so much of my life with someone who's main aim was to degrade me and make me feel small, insignificant and undeserving of something better. Has good come of me going through so much bad? Am I stronger for it, am I more able to cope with difficult situations, or will it in some way always haunt me and hold me back. Will I ever truly be able to put it all behind me and move forward completely unshackled. They say that the struggle a butterfly has to encounter in order to break through it's cocoon is essential. Without that struggle the butterfly would not be equipped to survive, so can the same be said for humans? Are the weakest of us the ones that have never known struggle or hardship, so if I was to take away all the bad that happened to me I would make myself less able to cope with life? I suppose it depends on the type of struggle doesn't it? Some forms of abuse leave such emotional scars on people they never manage to overcome them, or does that say more about the person than the experience? Are some of us just able to overcome anything and others never manage to, is that the wonder of life. I often question where I could have been now if I hadn't met him, I might have been married with kids living a totally different life. But on another hand I may have never met my current BF, I like to think that if it was our destiny to meet, our paths would have crossed some other way. But it's all questions isn't it, because none of us will ever know the answer. We don't have the power to turn back time and make changes to see which outcome we like best, it would be wonderful if we could wouldn't it? So because we aren't able to go back in time, my advice would be to take time and think about your choices. Try and separate yourself from big decisions and ask, in years to come will I be happy with this choice? You won't always be able to answer that question, but I know damn well if I had asked myself that 9 years ago I would have done things differently and escaped years of abuse. Sometimes pain is the easier option and making a change is far harder. Only you can change your destiny.